Hello, my name is Bill Rhinehart and I play in the Washington Nationals organization. A little background about me first is that I was selected in the 11th round of the 2007 draft by the Washington Nationals. I began my professional debut in the New York-Penn League playing for the Vermont Lake Monsters. Moving so far Northeast after playing four years at the Univeristy of Arizona was a big change for me because now I was playing every day as opposed to three to four days at Arizona. This was a positive change because it allowed me to develop the skills I needed as a first baseman after playing mostly outfield at Arizona. Even though my season in Vermont was cut three weeks short because of a pulled hamstring, I thought it was a success because I had made the All-Star team and obtained the skills I needed to become a better first baseman. After playing in the New York- Penn League, I was excited to go to my first spring training down in Florida. I wasn’t sure what to expect, but I did know that I was ready to start playing baseball again after a long winter back home in California. During spring training I was able to get back into the swing of baseball and prepare myself for the upcoming season. I worked out mostly with the Low A team and I enjoyed playing with some of my old teammates and meeting other players, and as spring training came to a close I had made the Hagerstown roster. When I got up to Hagerstown, the weather was so different from what I was used to, and I had to buy extra pairs of socks and hand warmers to stay warm. 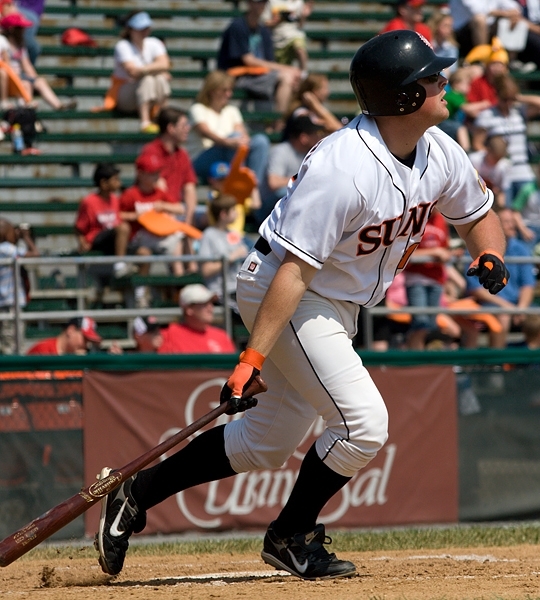 I spent the first half of the 2008 season in Hagerstown and made the All-Star team where I went 3 for 3 with a home run, and I was honored to be the MVP of the game. When I got back the next day my coach called me in the office and said that I was moving up to Potomac where our High A team is located. I was excited to get the call up, but at the same time I realized that I was going to have to keep playing my best so that I could do what I could to help the team win. Well, I didn’t spend much time there, and I only played seven games before moving up again to Double A in Harrisburg. I was surprised how fast I was able to move up, but at the same time I told myself this is still the game of baseball only now for a new team. I spent the second half of the 2008 season in Harrisburg and this is where I finished the year out. Playing in Harrisburg was a great opportunity for me, because I was able to see a different level of competition, so that I can be better prepared in the other levels of baseball I hope to play in. When I found out I was going to Arizona for the fall league I was very excited, because I knew I would be facing some great competition, and I was up for the challenge. We are in our second week here and so far our team is off to a great start. We are 7-1 right now and hopefully we continue this type of success. The guys on the team are great, and I have enjoyed meeting the new players from different organizations, and listening to them talk about their journey on how they made it here also. As a team we all get along well with each other, and when we are on the field we are out there to win. As for now, we still have a few more weeks of the season ahead of us, and I look forward to you to coming to watch the competition of the possible future big leaguers.